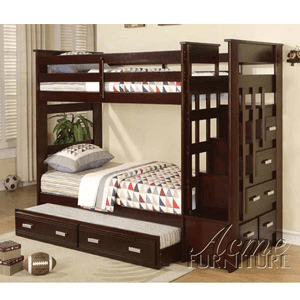 Allentown Twin-Over-Twin Bunk Bed features a pull-out trundle. It reflects solid hardwoods in an Espresso finish with stair step storage drawers leading to the top bunk. This bunk has a traditional style that’s easily suited for any bedroom environment. Height from floor to lower bed platform: 15 In. Height from bed of the lower bunk to the top bunk: 38 In.